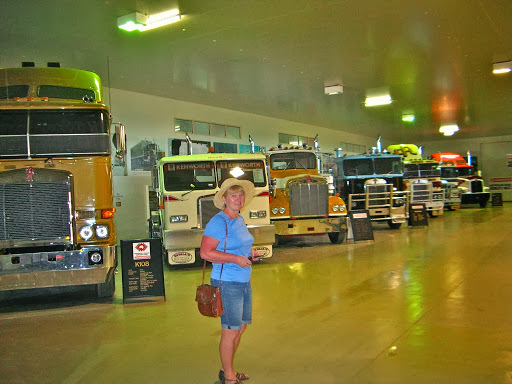 We went to the Alice Springs Transport Hall of Fame. Pretty good, lots of huge trucks, engines, machinery and cars to drool over. But they didn't have an Oka, which I consider a major omission. J in the Kenworth Hall. 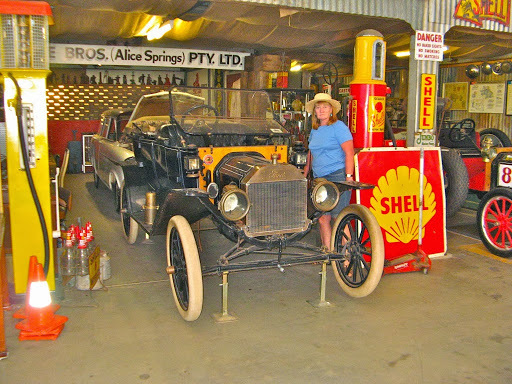 An excellent replica of a 1920's garage. Some of the tools I still use. 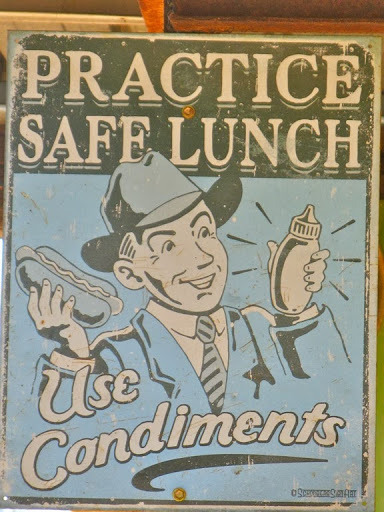 Had lunch at the Ghan Preservation Society, but the food was not so wonderful. Did washing, filled gas bottle, forgot to buy wine, booooooooring. Had to rush back into AS to buy wine when we discovered via the internet that bottle shops stay open from 2 till 9pm, not 6pm as some idiot read on the door. Topped up the front and rear diffs and had a cursory inspection underneath, then back into AS to fill remaining fuel tank and top up with water for the long trek to Port Augusta. Managed to squeeze 102 litres into one of our 100 litre tanks. I guess it must have been quite close to empty. At probably our heaviest weight ever (the Oka I mean), we left AS and headed down the Old Andado Track, now also confusingly called the Binns Track. Several other tracks are also called "Binns Tracks" so why change this one? Who knows, both names are on the sign posts. [Note we have a more detailed blog entry on the Old Andado Track from our 2005 trip here. The track hasn't changed much since then and most of the details are still valid. It's one of our most read blogs]. 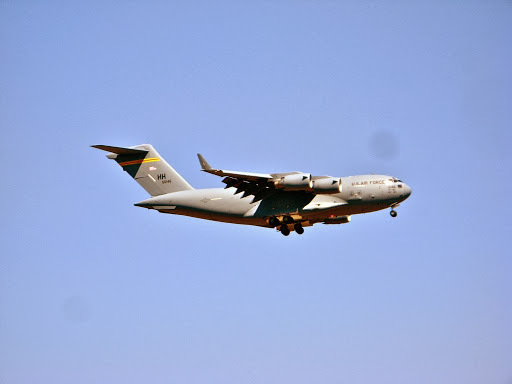 Watched a huge US Air Force C5 Galaxy landing at AS airport. Seemed to be crawling through the sky at 20kph. 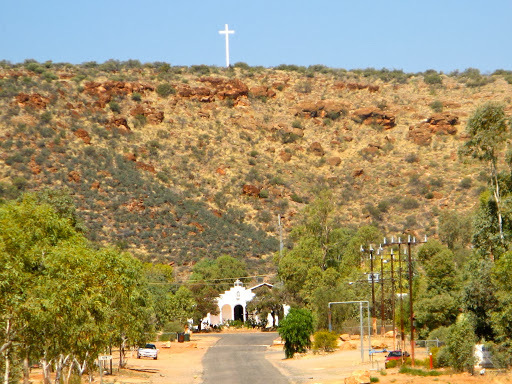 Went past Santa Teresa Mission which is now a large aboriginal community but with a huge white cross on the hilltop. 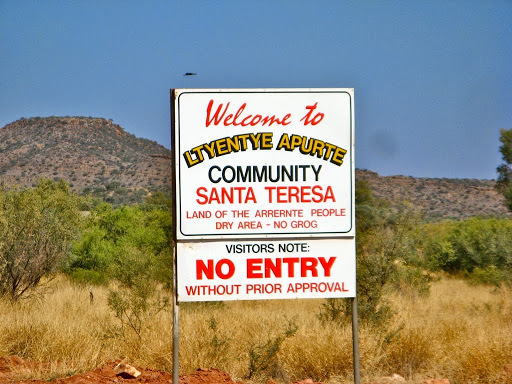 Sign says "Welcome to Santa Teresa" but also "No Entry without Prior Approval". The track is surprisingly good for the most part but becomes deeper sand through Allambi Station due apparently to flood damage (for the next 170km). The Allambi Station manager still has his light aircraft in his garage, just like when we passed by here in 2005. The airstrip is across the track from his garage so presumably he just drives it across. Aren't there laws about driving airplanes on public roads? The terrain is quite pretty with flowers and red sand dunes for company, and the Train Hills running alongside in the distance. 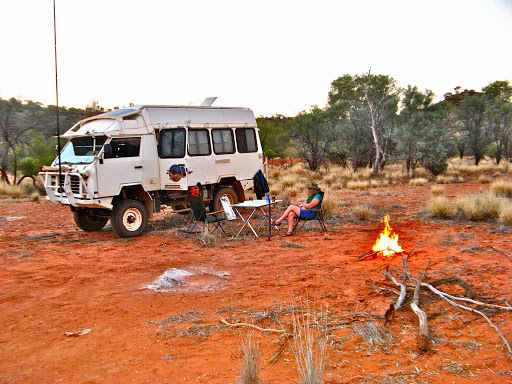 Camping just off the track about 130km SE of AS, just before the start of the Simpson Desert sand dunes. Very hot during the day but we had a campfire tonight to cook our roast pork on and then retreated inside into the warmth when the desert temperature plummeted. Our 42nd day since we saw a cloud. Surprisingly warm night after a few freezing ones, given that we are in a desert environment with very clear skies. It did get cold initially but then stopped plummeting and became quite warm. There was an almost full moon and maybe that contributed to the heating effect? We've experienced this temperature inversion phenomenon once before. 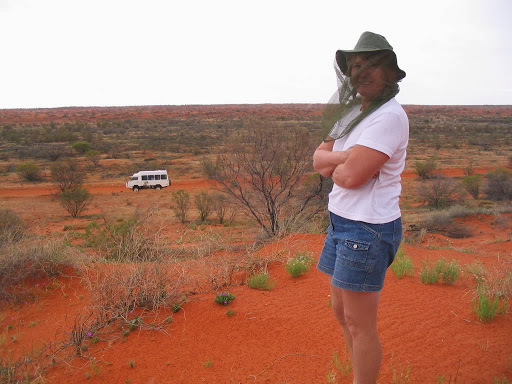 One evening when we were at the Bungle Bungles, we went to a ranger's talk and it was freezing. We were huddled together in hats, coats and jumpers and had hot soup at half time. Then a hot wind suddenly started blowing in, we thought it was a bushfire but it wasn't, and soon everyone had removed their jumpers and coats and we all started sweating. Very strange and here we had a similar event last night. This morning, sunny skies, warm conditions, lots of flies. They always seem to go together and they were about in their "fly-sands" today. It's the first time on this trip that we've both HAD to wear fly hats. We've also discovered a completely new race of flies which is totally impervious to Aerogard, in fact they seem to be attracted to it. Time to try another brand, Rid, Bushman's or garlic paste mixed with diesel, something which works anyway. 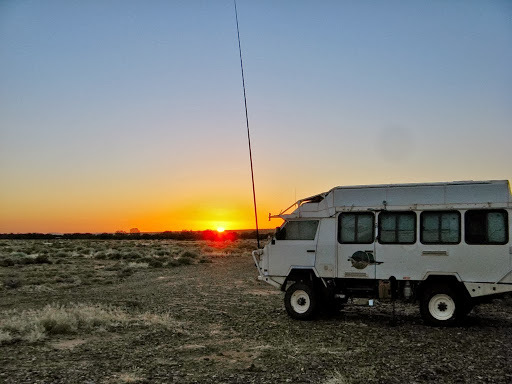 It's very quiet on the HF radio these days, it looks as though the peak season is over and most people have now headed home. Aug/Sept. is certainly the best time to get away, after the school hols but before the really hot weather starts up north, and the wildflowers have started emerging. Apr/May is also a good time but roads can still be closed if it's been a bad wet season. June/July are NOT good times (except for deserted desert tracks) due to increasingly crowded destinations and mad rushing about on the roads. 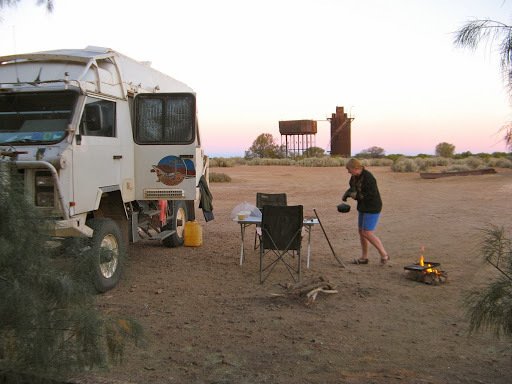 Desert tracks are never very crowded, witness our 8 days without seeing a soul, but with the exponential increase in numbers of camper trailers and off road caravans, remote and difficult to access locations are no longer the quiet backwaters they used to be. It amazes us how so many people still attempt to drag their huge caravans down tiny tracks without even knowing where they lead to or if they can even turn around. It potentially risks their holidays and inconveniences other more thinking travellers who have to help them out. We apply a policy of "if you can't get out, don't go in" which has saved us a few times even though we may have to miss out on seeing something. Gosh, we still have legs and often walk the 1/2 km or so instead of getting stuck somewhere or more commonly avoiding a roll-over situation. The Old Andado Track is a very nice drive but still remote and lonely. Only 1 traveller seen in 2 days. 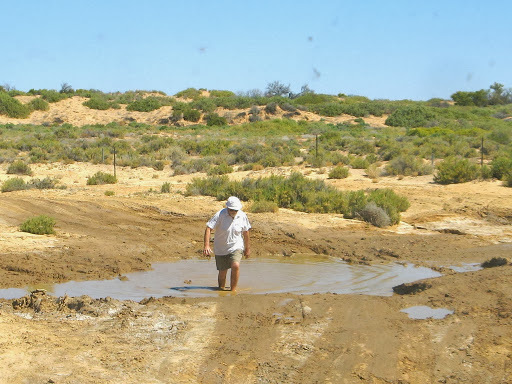 The track is pretty good, sandy and/or rocky in places but quite navigable and has been substantially rebuilt since our first trip in 2005 but still requires a 4WD for reliability. 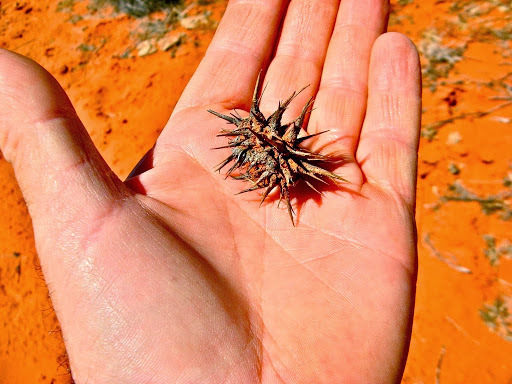 Some of the plants are a bit prickly underfoot. When they get into your sole, they stay got. We called into the Mac Clark Acacia Peuce Conservation Park which was set up to protect one of the last stands of the rare Acacia Peuce trees. These trees, called Waddy Wood were used by indigenous people to make fighting sticks,(called waddies) and early settlers for fence posts, due to the immensely hard grain of the timber. 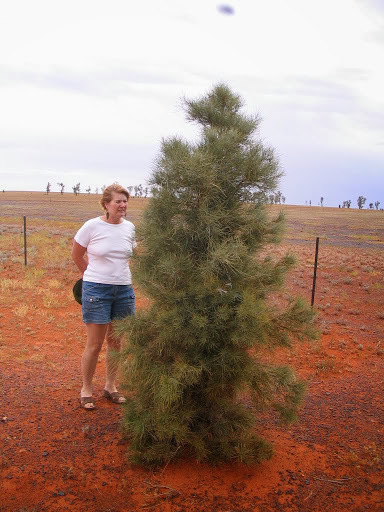 Only a few thousand trees remain, here and at Boulia and on the Birdsville Track. They are thought to live for up to 700 years but their age is not easily determined since the wood is impossible to cut with normal wood cutting tools. Around the trees are burrows and running tracks of the Plains Rat (Pseudormys Australis), a small marsupial that lives in large communities under the desert sand. This area is also home to the Letter Winged Kite, the world's only nocturnal raptor, which lives, very sensibly, on Plains Rats. We didn't see any since it wasn't dark, if you see what I mean. A few km later on we passed the exact spot where, in 2005, we encountered a sudden thunderstorm which turned the track to mud and we were stuck at the side of the track overnight until it dried up. This is the exact spot. After lunch we called into the Old Andado Homestead. It was deserted but a caretaker had been in residence until recently. The homestead belonged to Molly Clark who formerly ran Andado Station with her husband Mac, although she no longer lives here. 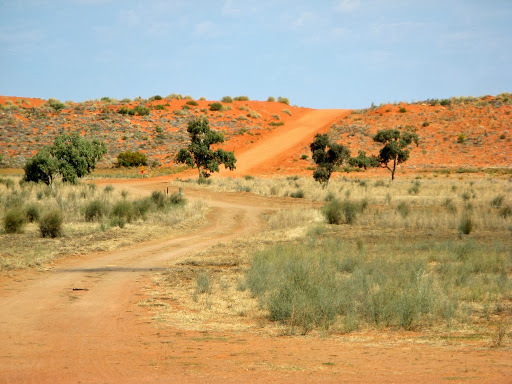 It's a step back into the past and allows travellers to experience what early life was like in the outback. Even a working telephone, all on an honour basis. All Molly's personal belongings and knick-knacks are still here and there are tea and coffee facilities and hot showers via a donkey engine. A generator can be started to pump water and provide lighting. We are camping here tonight. 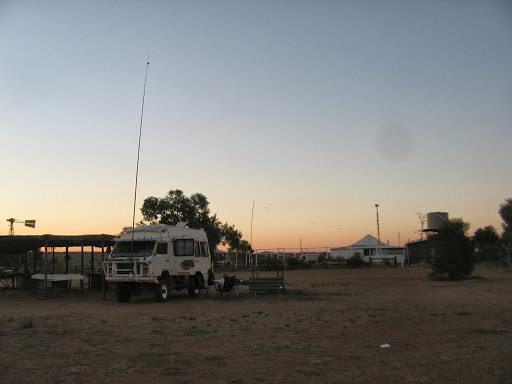 As we set up camp 4 other 4WD's roared up, each with 2 blokes, who all went to the loo and then disappeared into the homestead. We were a bit concerned over the valuables and honour money left in jars inside but when they came out, their leader came over and explained. They were from a group who periodically look after the homestead, working bees, renovations etc. 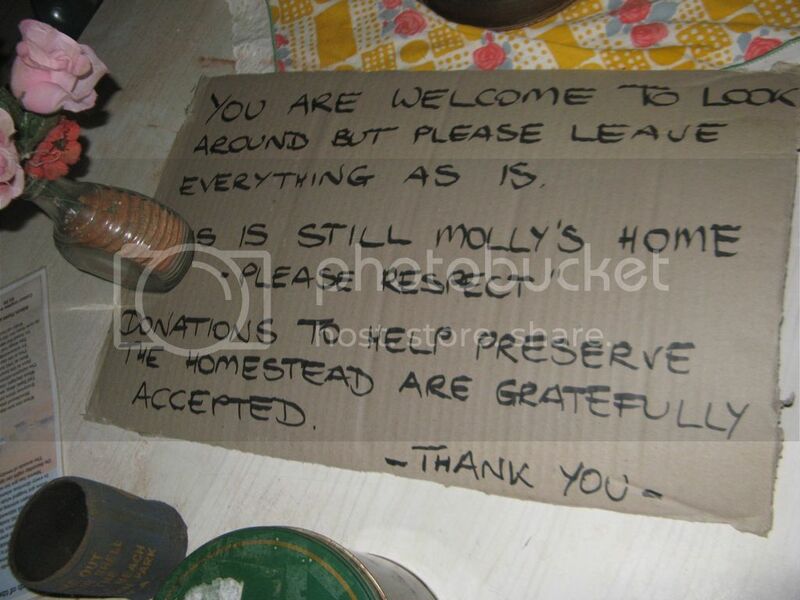 and he told us of the most recent floods which inundated the homestead in the past couple of years and caused a lot of household items to go mouldy or rot, which explained why things didn't look as nice as on our first visit. 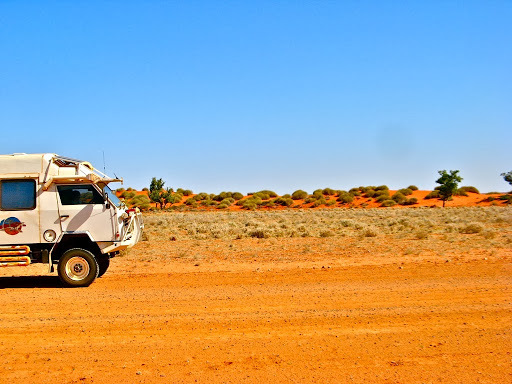 They were from Geelong on a one week trip across the Simpson up to Alice Springs and back to Geelong. That would normally take several weeks. Along the way they called in to Old Andado to collect the camping fees and hand them to the manager at Mt Dare station where they were heading to tonight. He gave us his card and had called Mt Dare to confirm their plans. They seemed genuine enough, for who would drive 4 vehicles 300 km into the desert just to steal a few dollars? It is with great sadness that we advise of the passing of Molly Clark. She passed away at her home in Alice Springs after a short illness on 22 September 2012, aged 89. 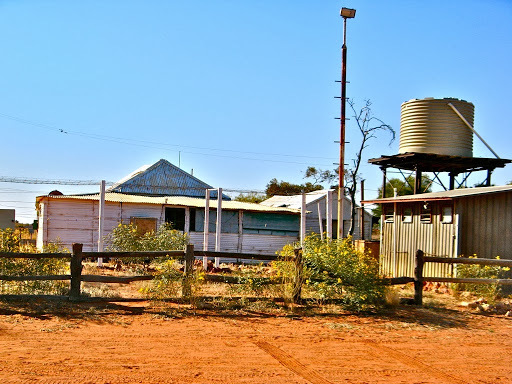 Molly had a position as governess at Mungerannie Station on the Birdsville Track, where she met Malcolm (Mac) Clark and married him in 1946. They had three sons Graham, Kevin and Philip. 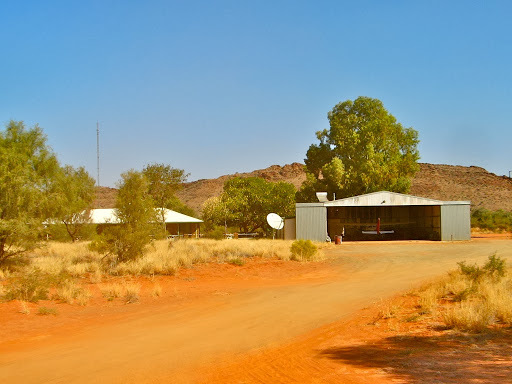 In 1955 the family arrived at Andado Station, around 330 km South East of Alice Springs. They lived initially in the original 1920's homestead which flooded easily. In 1960, they moved the house to higher ground, 18kms to the West. The next couple of years were difficult and often tragic. In 1975, Molly’s middle son Kevin had a car accident. This left him fighting for his life but fortunately he survived. In 1978, her husband died a week after suffering a heart attack. Nine months later, her eldest son Graham was killed in a freight train accident. Molly lost her livelihood when the Northern Territory Government was forced to destroy all her cattle. Molly sold the property in 1985 but retained the old homestead and a 45 square kilometres block. Molly found a new business venture catering to tourists. 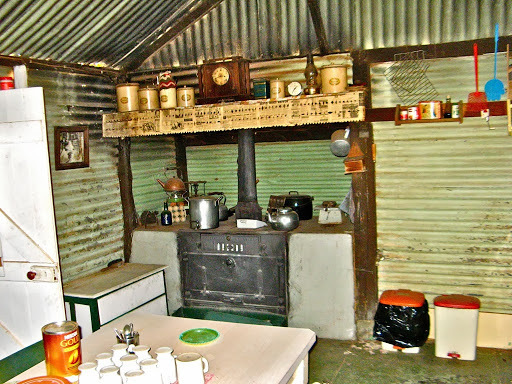 She set up camping facilities, cooked meals for visitors and provided personal guided tours of the homestead. 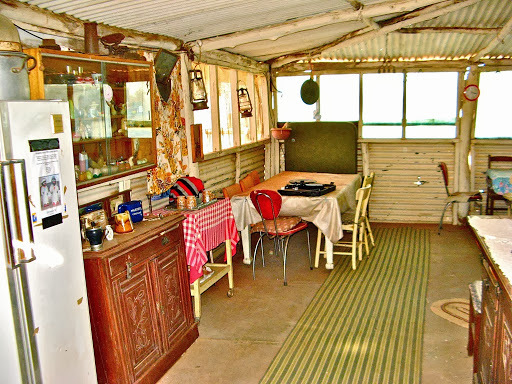 In 1993, her home, now called “Old Andado”, was listed in the Heritage Register and Molly received a Brolga Award in 1995 for her achievement in tourism. Among the other awards she received were the 1998 NT Chief Minister’s Women’s Achievements Award and in 1999 a Commonwealth Recognition Award for Senior Australians in the Northern Territory Electorate. 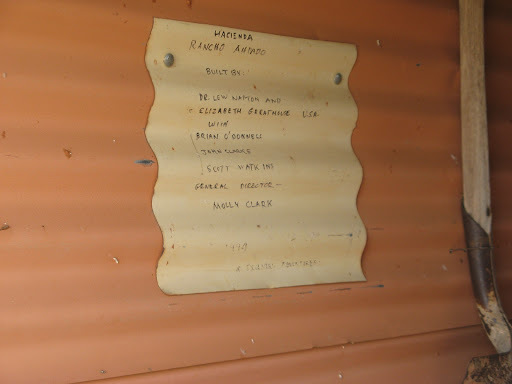 During the 1980s, Molly had some interest in the Stockman's Hall of Fame in Longreach, Queensland but was disappointed to find that women under represented. 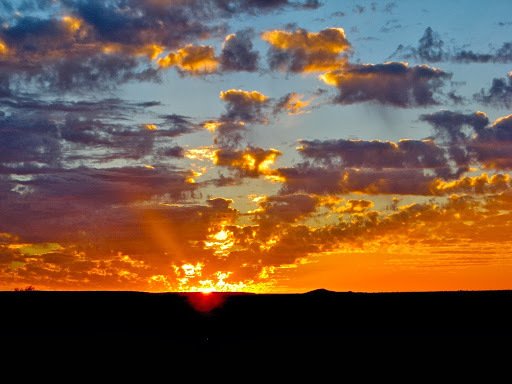 As a result she established the National Pioneer Women's Hall of Fame in Alice Springs. The National Women’s Hall of Fame and its museum had a temporary home at the old court house in Alice Springs. A permanent facility was found in the town’s old jailhouse and the Hall of Fame was officially re-opened on 8th March 2007, International Women’s Day. 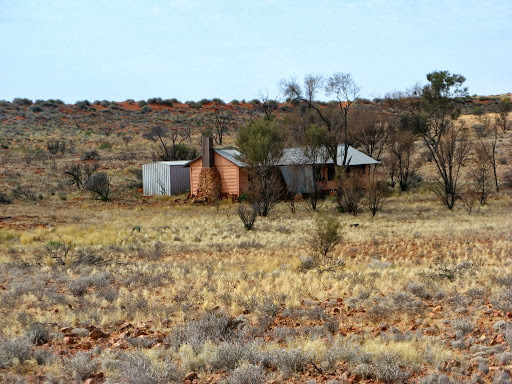 Molly’s poor health and eyesight meant she had to leave Andado after fifty years and move full time into her home in Alice Springs. Another cool but warm night and a clear sunny (obviously) sunrise. A few wisps of water vapour (which others may call clouds) in the air but that will soon burn off. Some hope. Unfortunately the water vapour turned into full-on clouds today, thus ruining our run of cloud free days. Anyway, 44 days without seeing a cloud is not a bad record, especially since it's around 60 days since we had any rain. 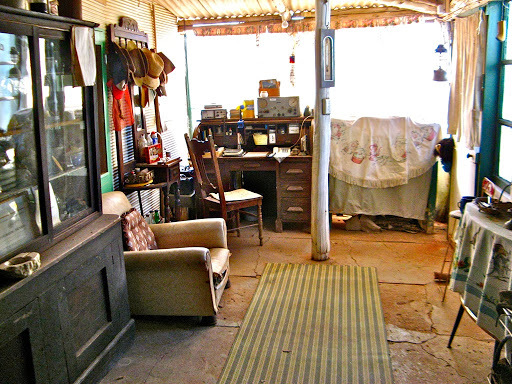 We visited a shack on Old Andado Station which is a well kept secret. It was built in 1994 apparently for a couple of Americans as it's an American style house and called the Hacienda Rancho Andado. 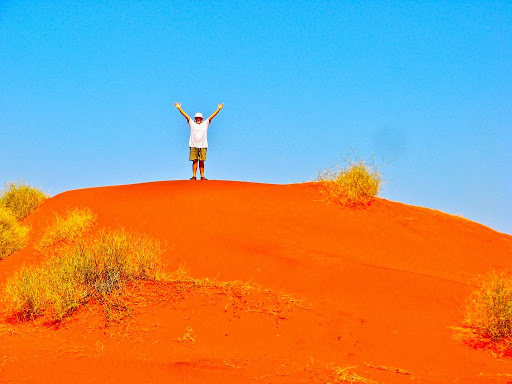 It's on top of a sand dune around 5km south of the Old Andado homestead and the couple come every year to stay there for a couple of weeks. Not sure what they do there for 2 weeks, there's no phone, TV, water supply or shops, just red sand dunes to gaze at, and flies to filter out of the milk. The track south from Old Andado has deteriorated substantially since our last visit and was a very difficult and slow drive though deep corrugated sand and bulldust for 120km to Mt Dare station just inside the SA border, actually in the Waritja (Simpson Desert) NP. Dalhousie Springs was our destination but we didn't quite make it as the track was so rough and frustrating and we ran out of daylight. So we are camped at 3 O'clock Creek about 15km short of Dalhousie. 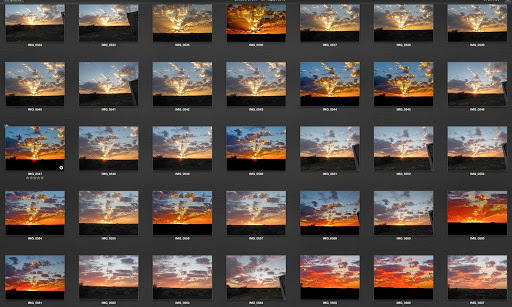 However due to the clouds, there was an excellent sunset tonight. Today our windscreen crack completed its journey east west and north from the chip we sustained on day 2 or our trip. Fortunately it only affects the passengers side of the windscreen and J can't see it anyway looking straight at it. However, an insurance replacement will be required. On the HF radio we heard of yet another roll-over fatality on the Stuart Highway and we worried that our folks back home may think we were involved. There's no phone service here but J assured me the next of kin would be advised before it was made public so we weren't too concerned. We could have asked our HF radio staff to make a reassuring phone call but we figured that might be even more worrying, receiving a call from a stranger about people they knew who were travelling in the area. People at home can call our HF radio service who could advise them when we had last called in (we call in daily), that we were all OK, where we were and where we were heading. I am currently writing an article on rollovers for the Oka Newsletter and the subject keeps on cropping up. That's the 3rd rollover accident we know of in the past week on the Stuart HIghway, one of which we came across and 2 others that had fatalities. According to a Adelaide Uni study, 80% of rollovers are caused by inattention, allowing the vehicle to drift off the left hand shoulder of the road and then over-correcting causing a spin and rollover. The correct response is to continue straight on with one set of wheels off the shoulder and slow down gradually until safe to return to the road. After dark we were scared witless by a terrible screeching noise from outside. 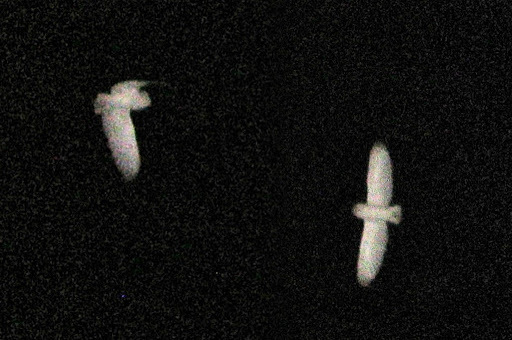 Upon investigation it appears we have parked too close to a tree where a pair of Barn Owls are nesting and the screeching of these large birds while in flight is a terrible sound in the dead of night, like a pterodactyl would have sounded in jurassic times. They almost appeared to be attacking us as they hovered and wheeled around just above head height. In the torch light their feathers shone brightly white, just like the book says they should, and they flew totally silently, except of course for the incessant screeching. I got the camera out and flashed them and also took video of their screeching sound. 31 Aug, and Spring has arrived (I'm ahead of schedule). We'll put yesterday's clouds behind us as an aberration. 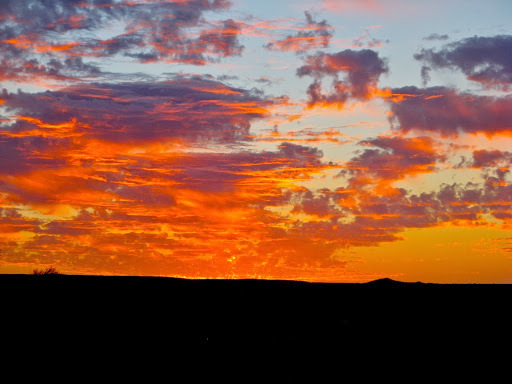 Today is totally cloudless again, as we've come to expect, and the sun rose like a red hot orange from the flat horizon. Yes, some of us were up but some were still asleep. Talked with George in Karanda regarding Telstra modems and phone tower coordinates. John from Mornington called and wants the phone tower website. 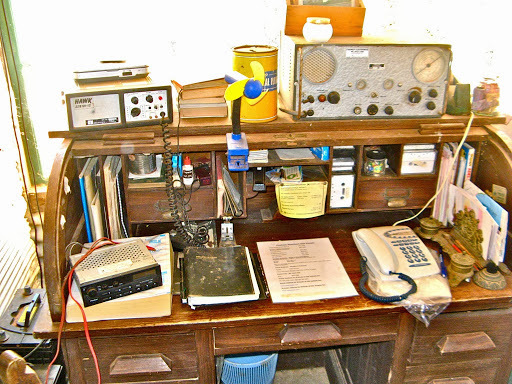 The wonders of HF radio, and it's free. Drove the remaining 15km to Dalhousie Springs on some of the worst tracks we've encountered, corrugated rocky gibber surface with occasional corrugated deep sandy sections. 15-20kph was the best we can achieve without damaging the tyres or shaking the Oka to pieces. 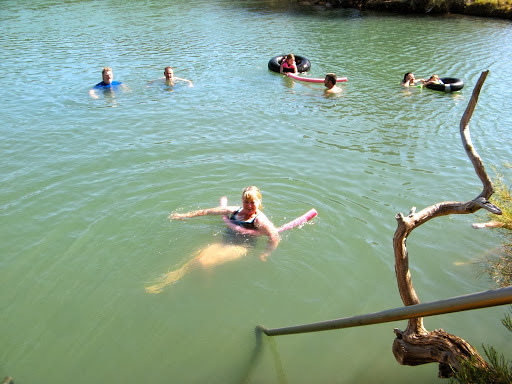 Anyway we had a good soak for an hour or so in the hot water of the lake, 38º which is too hot to swim in so you just laze about in the sun on noodles or tubes chatting to other soakers. J in a city Swimming Pool? No, in the middle of a desert. It might be hard to believe, but the temperature of the water in this lake is 38-40º all the year round. It's quite amazing to be able to laze about in a thermally heated lake, 100m long, in the middle of winter. Pretty chilly when you got out though. Leaving Dalhoiusie we intended to turn towards Oodnadatta,180km south, but only 3 km down the track we encountered a deep muddy creek crossing. Looks deceptively easy but we were alone in a desert, and it was deep soggy mud. There was no one else about and I walked across all 3 alternative crossing points but all were above knee deep soft mud and I was unwilling to risk getting stuck in the middle. The front would probably get through but the rear is very heavy and would probably have bogged down, and even if we had one, there was nowhere suitable to attach a winch cable to. We waited for 1/2 an hour but no one else came to assist if needed so we reluctantly turned back to take an alternate but 80km longer route. 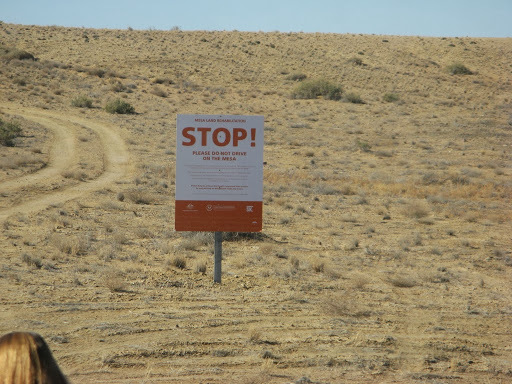 Overall we were shocked and disappointed that the Witjira NP, being one of SA's premier draw cards as part of the Simpson Desert NP is so poorly maintained and managed. There are 120 mound springs in the Dalhousie area and only 1 is accessible. 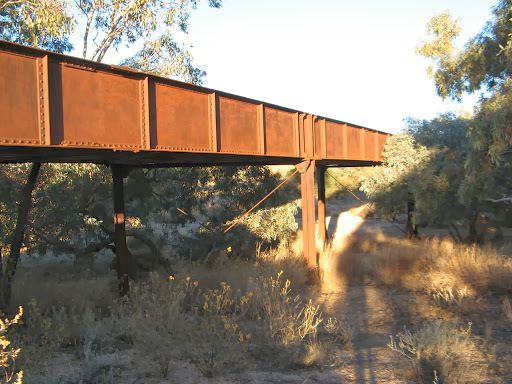 Several other points of interest exist in the park but very few have any signage or facilities, and the tracks are in a deplorable condition compared with other National Parks we've visited in the NT or WA. 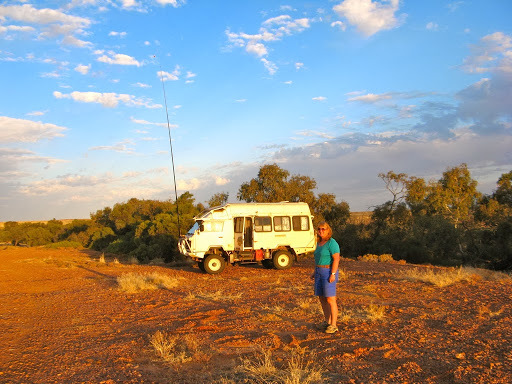 As it happens, the alternate route via Bloods Creek and Eringa Waterhole proved to be a much better track and more picturesque and we are camped by the very pretty and shady waterhole which is teeming with birdlife. 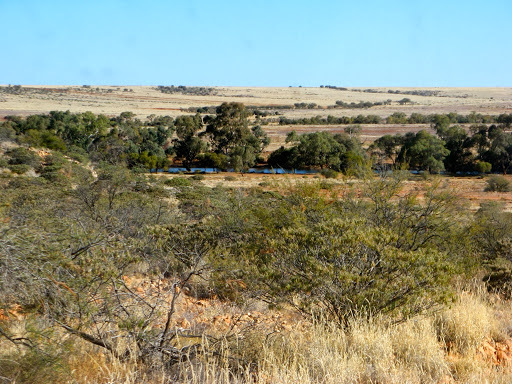 This track is the main supply route from Oodnadatta to Mt Dare and so it is much better maintained. On a sad note we were informed that the manager/owner of the Pink Roadhouse at Oodnadatta (Adam Plate) was killed in a car rally in Adelaide last weekend. See this report. 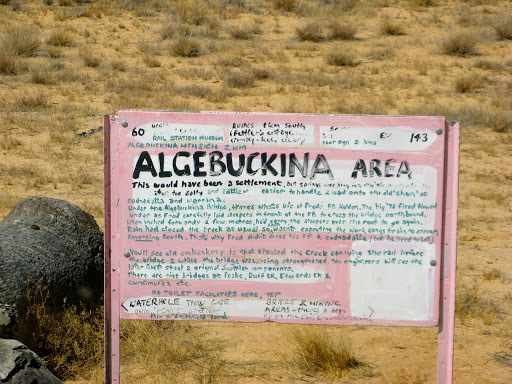 He was the instigator of many tourist initiatives in the north of SA, including the well known and informative pink signs which can be seen at hundreds of points of interest around the area. 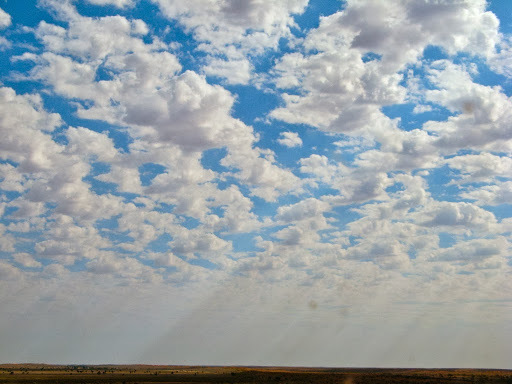 We saw one today on the old Ghan line more than 200km north of Oodnadatta. He will be sorely missed. 1 Sept, it really is spring now, and no clouds again. We were saddened to hear of the 5 Aussie soldiers killed in Afghanistan this week which quite upset our day. As we drove slowly through Oodnadata, the flags at the police station were all flying at half mast in respect for both the Aussies killed in Afghanistan and the Pink Roadhouse owner killed last weekend. 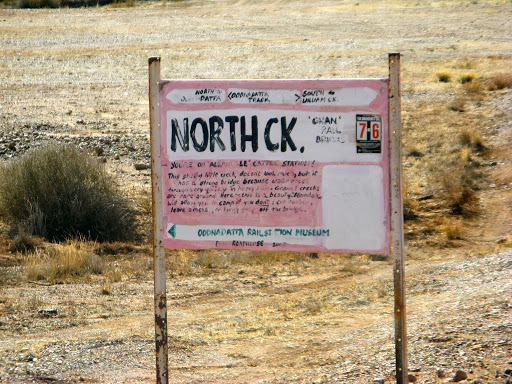 We are camped at North Creek about 20km south of Oodnadatta. Allandale station will allow camping here if: "you don't make a mess, cut timber or bungy jump off the bridge". The bridge is only about 4 m high. We had a campfire with jacket potatoes cooked in foil and chucked in the fire, and left overs with fresh veggies. J then made an excellent fruit cake in the hot coals which we had with custard. The Crows had a good win which could put them top of the ladder going into the finals but we don't have a phone service here to confirm this. Just after dinner a "mouse" appeared from beneath the Oka. 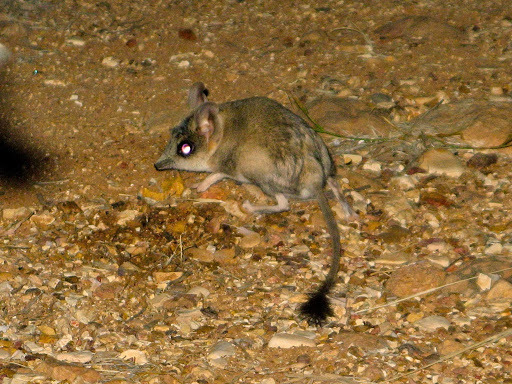 However it wasn't mouse it was a native marsupial brush-tailed dunnart (or similar). Actually I discovered later that it is a Kultarr (Antechinomys laniger), also known as the Jerboa Pouched-mouse, the Wuhl-wuhl or the Pitchi-pitchi formerly thought to be in the Dunnart genus but recently determined to be a separate species. It was joined by its mate and they were quite cheeky and not shy at all as they hopped and scurried about. I managed to get a few photos to prove it all. Called into Algebuckina Creek to collect some creek water for washing clothes and took some more water for rinsing. It's a bit salty. 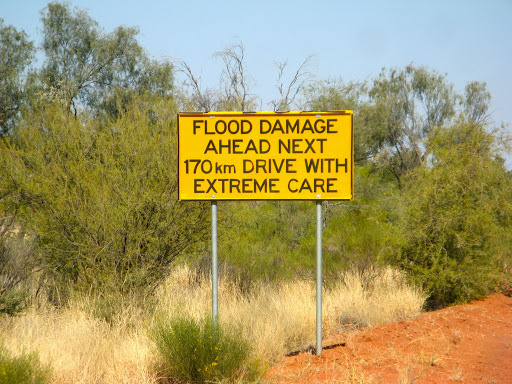 The stretch of road for about 100km north of William Creek has been dubbed the "Mike Rann Highway", presumably because it's as rough as guts. In some places the cattle grids were smoother than the road surface. Crawled through the mighty township of William Creek. There's a new shed/hangar for the aircraft but apart from that nothing seems to have changed in 5 years. 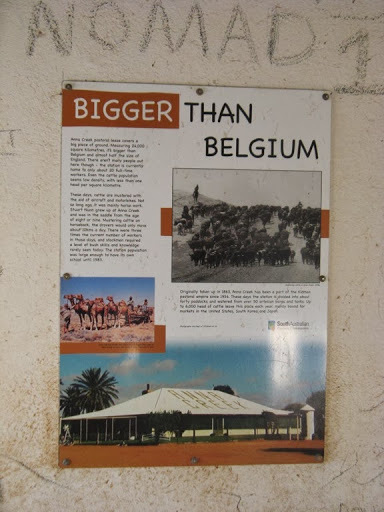 Anna Creek Station (a Kidman company) owns all the land around here, all 24,000 sq km of it, which this poster says is larger than Belgium and almost half the size of England. However, they are incorrect, Anna Creek station is actually only 80% the size of Belgium and about 20% the size of England. It's still a very large area though considering only 20 people live and work on the station. They have erected a few signs asking people no to drive on the Mesas (small hills of clay) as it affects the flora and fauna of the area. I suggest that 20,000 head of cattle might have just a little more impact on the flora and fauna than a few wheel tracks? If they'd asked people not to drive on the Mesas since it buggers up the view for other travellers, people might feel a bit more inclined to comply. Along the track Anna Creek cowboys were mustering a herd of cattle on motorbikes. The track continues its tiresome way and we are camped at Beresford Siding, one of the many now abandoned and falling down sections of the Old Ghan Track. 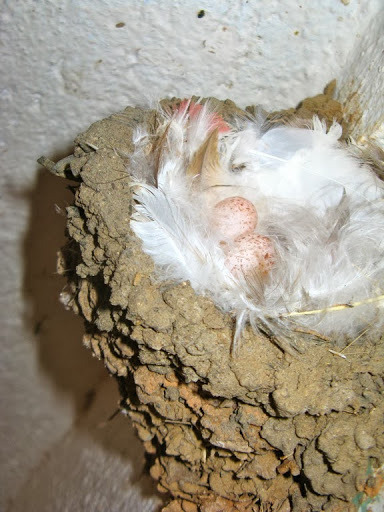 In the old deserted fettler's cottages, a Welcome Swallow had built it's beautifully lined mud nest. I could sleep comfortably in such a bed. Quite a hot tiring day today 27º and we had the a/c on several times, but a cool evening around the campfire. Tonight J cooked an Apple cake but we left it in the fire a few minutes too long and the it was a bit brown on the outside. The insides were good though. 3 Sept, another cloudless day. Grumpy fellow with a Nissan Ute/rear camper walked pass with a friendly " Wouldn't want to be paying your fuel bills". "G'Day" I said, "we get over 20 mpg which isn't bad for a 6 tonne vehicle" and he said "We get 30-40 mpg from ours". Lying basket, I just don't believe it. Maybe unloaded and with a tail wind off the edge of a cliff he might make 30 mpg but carrying a full load on outback tracks? No way. Anyway he asked about the engine, as they always do, and then grunted as if to infer he knew what I was talking about and went on his grumpy way. I should have asked how he liked living outdoors when it was cold wet and windy, or hot and flyblown, and where was their shower located, but I didn't think of such a smart comeback at the time. I'm just happy in the knowledge that most 4WD's hauling a caravan get worse fuel consumption than we do. 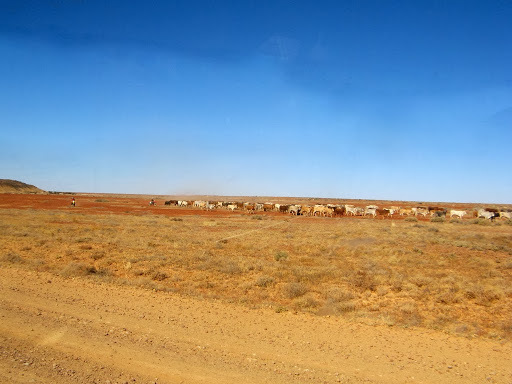 We called in at Curdimurka Siding, a deserted empty dusty plain but the site for the annual outback ball. It was here in 2003 that our friend Charles cut his thumb and J had to apply first aid (a Bandaid). 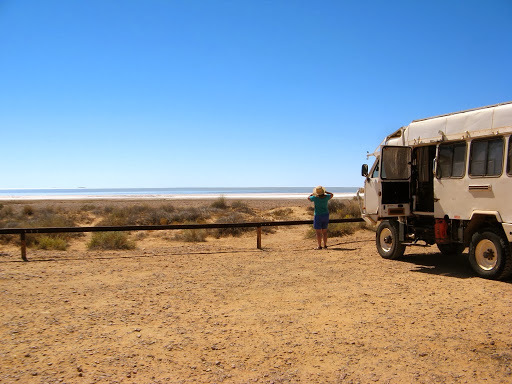 Later we stopped for lunch near Lake Eyre South. The lake is partly filled with water still after 2 consecutive very wet seasons in Queensland, and it looked beautiful. Already quite warm at 10.00 am and the flies are loving it. Heading south to Farina today, only 2 or 3 days from home now. It's been a good and long trek and we are looking forwards, with some trepidation, to the long grass and mess at home and sadly no dog to greet us any more, but summer is coming and we'll soon have it all under control. We always do. 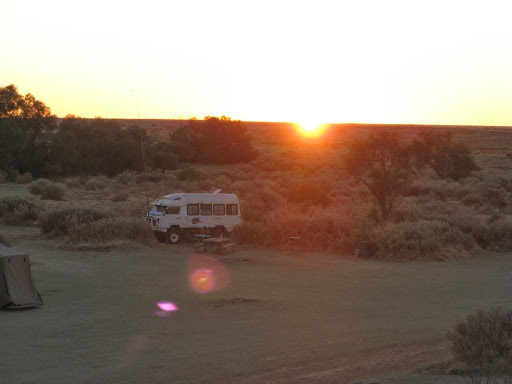 Reached Farina and it's nice bush camping ground and a good sunset. Had a really long drive today, 444 km, which in an Oka is a very long way, but we decided to get home on Wednesday rather than Thursday and the roads are pretty good and not too many d**kheads about. It's been pretty hot again today, 27º and no clouds and the a/c on and off all day. We assumed it would get colder as we moved south but we appear to be bringing the warm weather with us. Only time, as they say, will tell. Since we didn't need fuel or supplies we passed through Lyndhurst, Copley, Leigh Creek (actually I lied, we did put in 40 L there, just in case), Hawker, Quorn but bypassed Pt Augusta since it's a 20km diversion which would take an hour. Camped at the small conservation park we found several years ago at Clements Gap near Pt Broughton. Arrived home safely around lunchtime after an extremely windy and showery drive from Pt Broughton. Weeds have had another field day but apart for some dust and grime everything else seems fine. The cat just assumed we'd been to the shops. 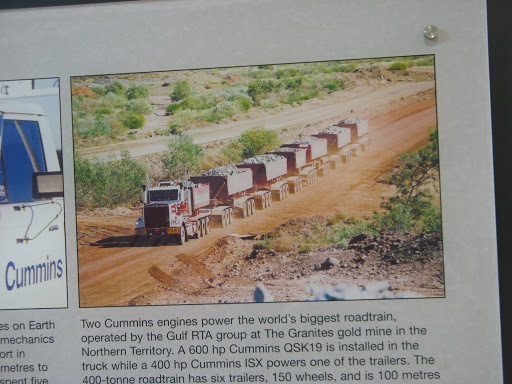 We'd done the nearly 2000 km of outback sandy/gravel tracks from Alice Springs to home across using only our internal fuel supplies plus the 40 L we had to put in at Leigh Creek. (100+100+45+20 from internal tanks = 265 litres plus 40 litres at Leigh Creek = 305 litres or 6.55km/l and we still had 30 odd litres left so it was really nearer 7km/l). If we'd really pushed the limits we could have done all 2000km on internal tanks alone. 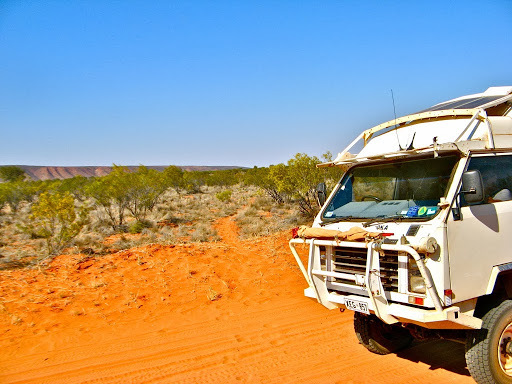 We've done 13,000 km in 3 months across 3 states, 5 deserts and 10 outback tracks. No punctures (although 2 tyres have made their last trips), no major breakdowns (only a broken shock absorber mount) and only a few of the normal electrical problems. All the mechanical mods, upgrades and preparations worked fine. Nevertheless, I now have 37 items on my todo list of improvements, fixes or minor annoyances to address before our next trip, some of which might actually get done. If we wanted to, after a few days maintenance, we could confidently take off again on another trip. Considering the pounding and difficulties on some of the tracks we've done, I continue to be impressed with the capabilities of our Oka. 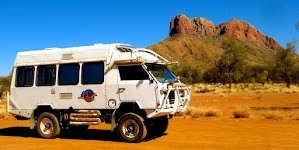 It's a 6 tonne monster but it's also our home and lifeline while in remote locations. It's not fast or nimble but there are not many places it hasn't successfully taken us to (and brought us back from). So another very good trip, the best part being the Eagle Highway section (which has substantially disappeared from view now) while in the company of Dave and Pauline and several casks of wine. 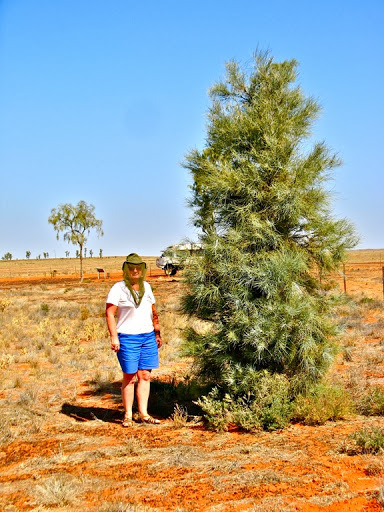 Naturally, you'd like to read all about our 2012 outback travels again and again, so this link will take you back to the navigation page.